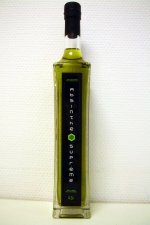 Absinthe Supreme from Urbano pleme is the first absinthe to come from Slovenia. It is presented in a good looking, modern kind of olive-oil style bottle with modern looking labels. But is there more to it than fancy packaging? The Supreme Icon isn't really an absinthe per se but rather a ready made variation of the classic Hemingway cocktail; "Death in the Afternoon". That is - sparkling wine mixed with absinthe.